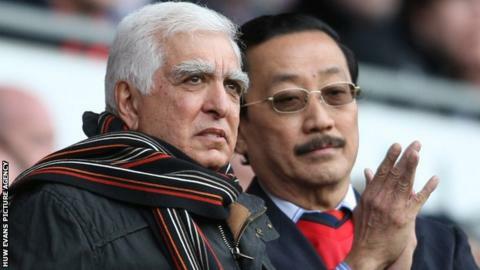 Cardiff City Football Club has stepped up the legal battle with former owner Sam Hammam and creditors Langston. In February, Hammam confirmed Vincent Tan and the club were being sued for nearly £6m owed to Langston. But the Championship club has now issued a counterclaim against Hammam and Langston with the High Court. The claim was made on Wednesday and will run alongside the one made by Langston, which claims that £5.75m was due to be paid on 30 January. A procedural hearing - known as a case management conference - will be fixed in the next few weeks. It is believed Cardiff City will claim the club actually overpaid on the debt. The club is determined to know the identity of the corporation. Club president Hammam has been widely seen as Langston's representative. However, Cardiff chairman Mehmet Dalman maintained that Hammam had told the club he was ''not'' a representative of Langston. It is understood the club want to oust Hammam from his position of life president, which was part of the settlement on a debt of £24m in the form of loan notes, issued when Hammam was at the helm of Cardiff.